Fellow blogger Kevin From Canada asked if I would write a post about the production I am currently appearing in, War Horse. He was intrigued to know what it is like to be a part of such a successful show. For those of you who have no idea what I'm talking about, a little background first. War Horse is a children's novel by Michael Morpurgo, former children's Laureate. Written from the point of view of the horse, Joey, it tells the story of how he becomes part of the cavalry in the First World War and the lengths to which the boy who helped to raise him will go to to be reunited with him. The National Theatre in conjunction with Handspring Puppet Company adapted the book into a play which was successful enough to be revived the following Christmas and then transfer into the West End where it continues to run at the New London Theatre. The show has become famous because of its extraordinary puppets, most notably the life-size horses which are controlled by three actors. I'll tell you first a little bit about the machinations behind the show and then what it's actually like to do each night. 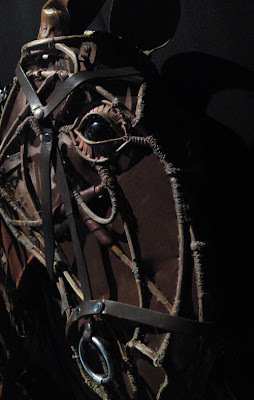 As I mentioned, each horse puppet requires three actors to operate it, called the Head, Heart and Hind. The head operator is outside the horse, supporting the head and controlling its movement and that of the ears too. The Heart is inside the horse operating the front legs and creating the breathing of the animal with the rise and fall of the body which they are helping to support. Finally, the Hind, controls the back legs and movement of the tail, working together with the Heart to support the weight of anyone that happens to ride the horse (that's right, at the end of the day if someone's rides that horse they're sitting on the shoulders of two actors). With two horses in the show and the physical demands placed on the actors who make them live there are actually four horse teams in the cast who rotate through the weeks of the run to help stave off injury. In theory that is. With the inevitable injuries that crop up and the days of holiday that have to be taken during the long run, horse teams inevitably end up getting a bit mixed up and having to swap in and out of various configurations. One of the wonders of the show is the way the horse teams work together to create a convincing experience for the audience. Part of this is also due to the latitude that exists for them within performance. This isn't choreography; with the same kind of intentions and actions as any other actor on stage they are acting and reacting to what they receive from others. For those of us working with them onstage it really can be as unpredictable as breaking that old maxim and working with animals. The horses are like a microcosm of the show as a whole as holiday and illness mean that at any one time there will be at least two or three members of the cast off. Before each show begins the cast will assemble and a list of 'knock-ons' will be read out in which parts and the minutiae of the show will be allocated. Now, I've said parts there, but I don't want you to think that this is some kind of theatre collective where we all know everything and just swap them around. Every part has a first and second cover so that no matter what the disaster, the show will go on (just last week we had three people away on holiday and two off sick for one show and yet we managed to make it all happen), but for those little elements of movement work or prop and scenery moving performed by the cast there is definitely an all hands to the pump kind of feel. The constant changes in this vein mean that there are hardly ever two shows that are the same, which of course helps to keep it interesting, and to keep the cast focused of course. 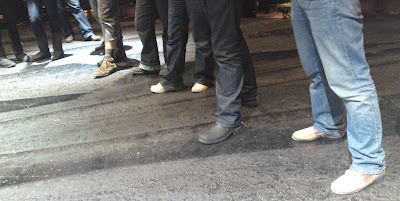 Genuine West End feet during the pre-show meeting. Much is made of the word 'ensemble' with some shows but I can proudly say that in no other show I've worked on has the word been so appropriately used. A cast of 31 actors helps to make that show happen each night, everyone an absolutely integral part of the story, no big names amongst the cast and everyone, and I mean absolutely everyone, playing multiple roles and getting their hands dirty (I mean this literally as we have to slather ourselves in 'mud' for those battle scenes and I still haven't managed to find a really effective way of getting rid of it from all the nooks and crannies). I mention this only because a quick look at a few other shows in the West End might lead you to believe that the only chance of commercial success is to place a few well-known TV faces in the cast, they don't even have to be actors necessarily, and watch the bookings come in. We may have strength in numbers but there is something very encouraging about the extended runs, the full houses, and the rapturous reception which accompanies a show which focuses on the story and the creativity required to tell it rather than any celebrity. So what's it like to be in a 5-star West End smash-hit (he asked himself smugly)? There are several things that are remarkable. A show that is selling well is obviously a joy to be in. 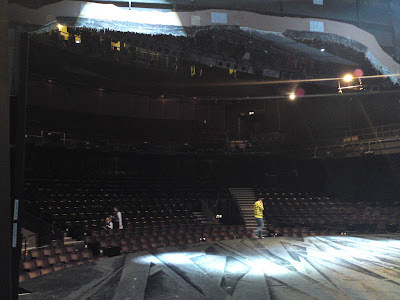 Performing in front of a half-empty theatre can be demoralising, not to mention much harder work. The New London holds around 1100 people and to see that theatre full, night after night, is something I'm trying not to take for granted. The response from an audience that size to a show that is as emotional as ours can be quite overwhelming. To see members of the audience standing at the end is not a very English thing and yet we had a week of shows last week when people stood every night, tears coursing down faces, smiles stretching from ear to ear. The tears. With a stage that bulges out into the audience so much and lighting that illuminates the first seven or eight rows I can see perfectly well the reactions of people to the play's final few scenes. It's quite hard to keep focus actually when you can see people grabbing onto partners arms or hiding behind tear-stained hankies. I've even seen people start crying in the plays opening moments leading me to worry about the risk of dehydration by the end of the play's two-and-a-half hour running time. You may well have heard about the Queen's recent visit to the show. To have an unofficial visit like that was extraordinary. We knew on the day that she would be coming but the audience did not of course and it wasn't until the end of the first half that many of them twigged who exactly it was sitting in row K next to someone who looked remarkably like Prince Philip. I happened to be playing Captain Stewart that night which meant that I finished the first half mounted on horseback, sword in hand, charging right at her. Now that doesn't happen every day. Her daughter Princess Anne has already been to see the show and we have since been visited by Prince William so if The Prince Of Wales is reading, we just need you for a Royal Flush. This has helped to increase interest in the show even further of course and that is why the run has recently been extended into 2011. I mentioned the lack of celebrities on stage; the fact is that the celebrities tend to be in the audience and we have a list on the wall of some of the famous faces to have been spotted. A list like that often has some comedy amendments made to it, ridiculously famous people who haven't really seen the show, but recently it's been difficult to know for sure which is which. Just last week we were visited by Morgan Freeman no less and last night we had a visit which turned one of the long standing jokes amongst actors all over the country into reality. Many times on a show it has been joked amongst a cast that 'Spielberg is in tonight.' Well, last night he was. I know. Ridiculous. And do you want to know the punchline? I'm away on holiday this week. My moment with Spielberg will have to wait (He's here as part of preparations for his film version of War Horse). So, a show that keeps packing audiences in, celebrities and all, for the foreseeable future, a show that keeps everyone honest and doing something a little different every night, a show that manages to make audiences laugh, cry, gasp and applaud; that's the kind of show you always dream being a part of, so I'm a very lucky chap, no doubt about it, and very pleased to be remaining with the company as the show extends its run. I hope this has given you an idea of what it's like to be a part of it but please feel free to ask any questions you want in the comment section below. I'm off now to find out Morgan Freeman's number. He needs to explain to Spielberg what, or rather who, was missing from the show last night. How fascinating to read this insider's account. And great to hear that you have been extended to 2011. A palpable hit! I heard Michael Morpurgo talking about it on the radio. He said how dubious he was when it was first suggested to him, and how gobsmacked he was by the solution. Good luck with Spielberg! Do I join the queue for your autograph? Rob, I'm afraid my autograph is worth so little it has been known to devalue cheques. Will: Thank you very much for such an extensive response to my request. While I know a little bit about "normal" theatre, the business of producing a show with such a large cast and unconventional puppets adds several layers of complexity -- I appreciate the time you took to explain how every performance doesn't just have its own "character", it has its own cast. And the insight on how the celebrity list out front plays back stage is great fun. I hope the extended run proves as challenging and enjoyable as the first few months have. Thanks again for the post. I enjoyed writing it Kevin so I'm pleased you enjoyed reading it. It's weird actually to be away from the theatre this week but ask me again in a few days and I'm sure the answer will be different! I got an email today that had War Horse on the short list for the Olivier Audience award -- so of course I submitted a vote. Good luck. We have indeed been nominated for the Audience Award at the Olivier's. We're up against some very stiff competition but I'm very proud that we're the only non-musical on the shortlist. Thank you for your vote Kevin. I am organizing a North American movement. I admit that I haven't seen War Horse but have seen all but one of the other contenders. I think proper drama deserves a win. Thanks for the message Kal and I shall accept with gratitude your congratulations in their virtual form. I'm so pleased you enjoyed the show. I shall grill my Dad all about your lunch when I speak to him next.